Also known as Christmas in a mug!! You guys. I can’t believe it’s already December 9th, NOOO. I need this month to slow down. First of all, I’m feeling a little under the weather, I’ve got some kind of chest cold/flu thing that I’m hoping will magically go away…ASAP. I mean you guys, people have already started to arrive for Christmas and Dew Tour. Yes, today is the first day of Dew Tour here in Breckenridge. I’ve got to go brave the freezing cold temps to cheer on my younger brother Red while he competes <–send me warm vibes cause I just might freeze. Secondly, I’ve yet to start doing all the Christmassy things I love…I need to change this now! My cousin Maggie has this whole month of December Christmassy things down. She’s doing things like drinking hot chocolate, decorating, stringing popcorn and watching The Polar Express – YES! She’s a girl after my own heart. Like those are definite Christmastime goals for me right there! 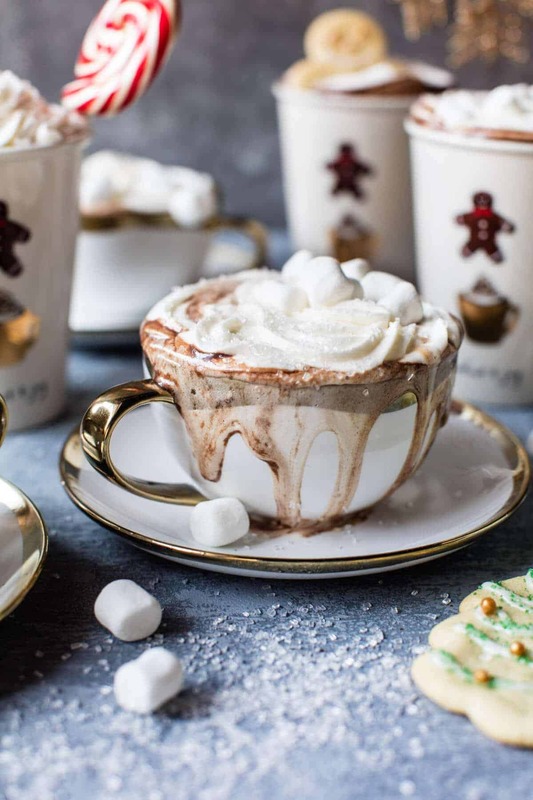 Anyway, I wanted to share this delicious sugar cookie hot chocolate with you guys today – because it’s Friday, and our weekend needs to be filled with mug after mug of chocolate and marathons of Christmas movies, I mean, obviously. OK, and after today’s day spent just standing in the cold I’ll most likely be needing a cup or two…or three myself. I know it’s no secret, but my mom’s a freak for all things hot chocolate. I kid you not, she has like two cups a day. One in the morning and one before bed. She’s even turned my little sister Asher into a hot chocolate freak. Mom’s recently switched to a mostly cacao blend, but she still lives for a really indulgent cup like this. 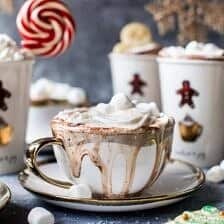 It seems like every December I find it in myself to come up with yet another hot chocolate recipe to share. 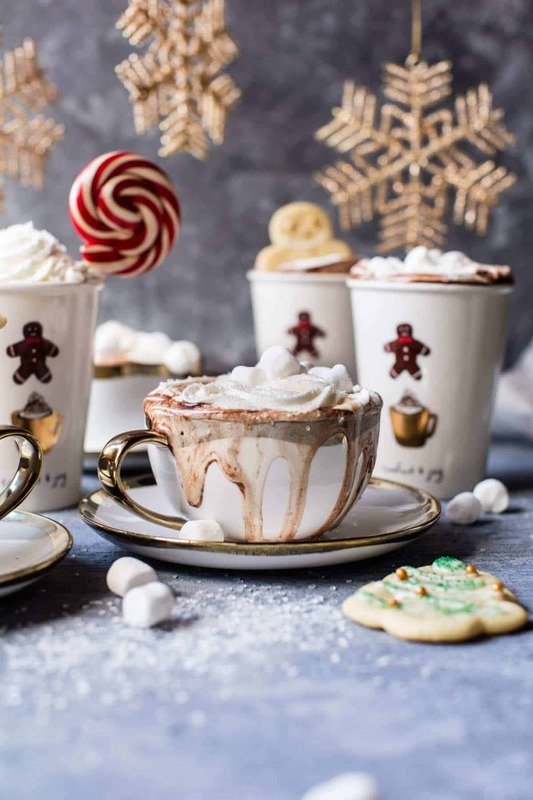 You see to me, it just wouldn’t be the holiday season without lots and lots of hot chocolate. Anyone there with me? Another must of the holiday season, SUGAR COOKIES. You can’t do the holiday without sugar cookies, they’re basically a requirement. So I got to thinking, “why not just combine the two”. Originally, I was thinking of making a white hot chocolate, but then when it came down to it, I just couldn’t do it, I need the real stuff. 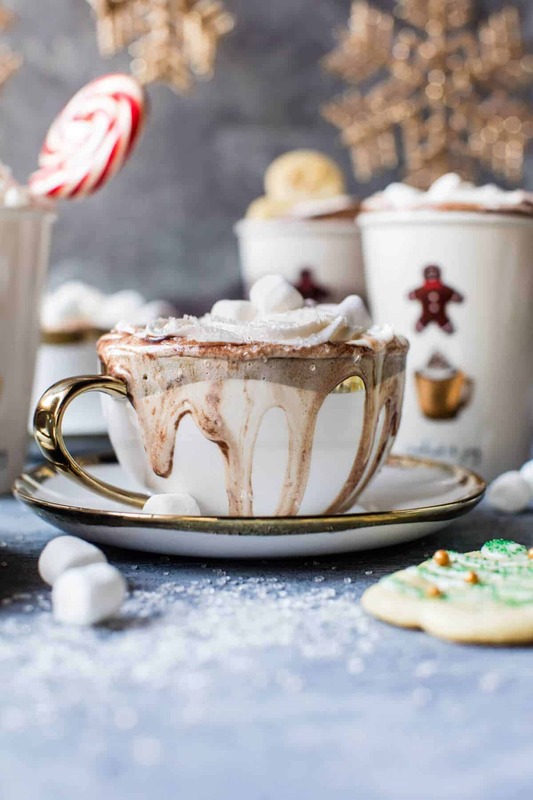 So I created this super sweet and incredibly creamy hot chocolate instead…flavored just like my favorite sugar cookies…but with a special ingredient that makes it just perfect. I’m talking about sweetened condensed milk, the perfect thing to make this hot chocolate the best of the season! 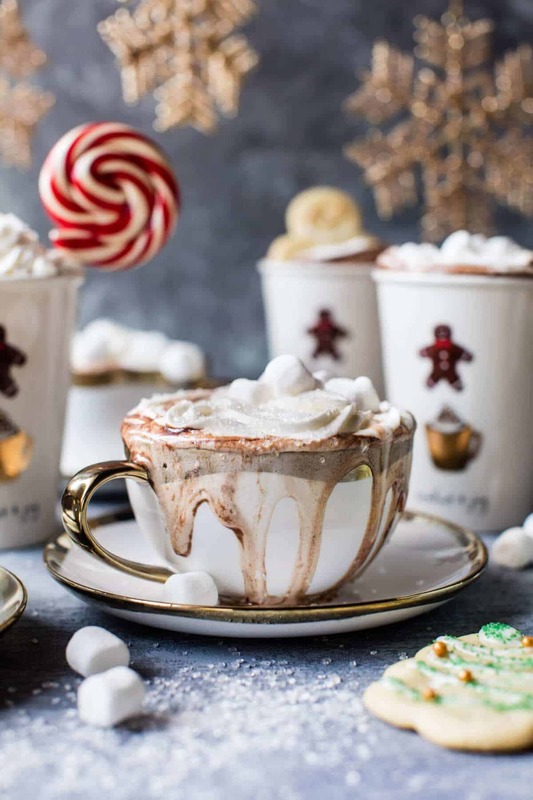 What’s also great about this hot cocoa is that kids love it too. 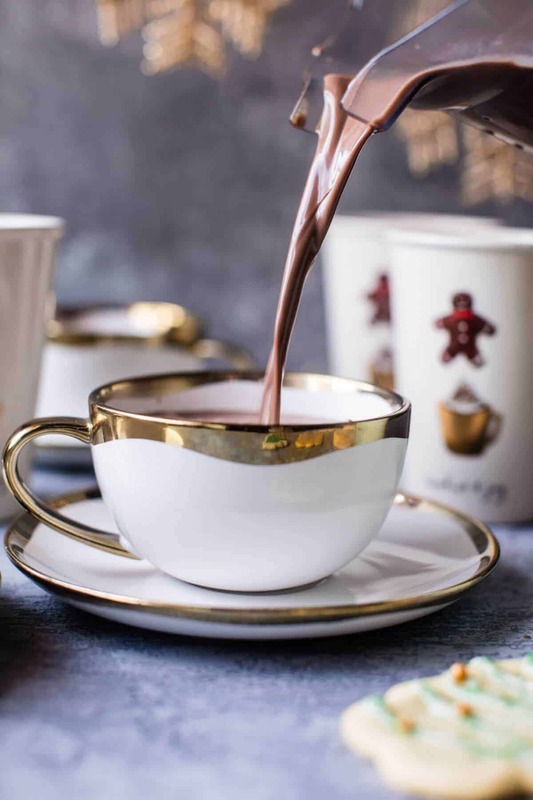 Sometimes hot chocolate can get all fancy with things like dark chocolate and coffee, but this version is perfect for all! Plus, you get to drink it with lots of sugar cookies, yes, please. 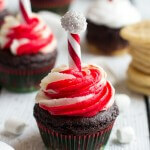 Oh, and whipped cream and marshmallows too, I mean, of course! Add the milk, sweetened condensed milk, cocoa powder, chocolate, vanilla, and almond extract (if using) to a large pot. Place the pot over medium low heat until the milk is scalding, but not boiling. Be sure to stir the pot often to make sure nothing is sticking to the bottom and burning. Once the hot chocolate is steaming, ladle into mugs and dollop with whipped cream. Add marshmallows, cookies and a sprinkle of sugar if desired. Drink! Happy Friday! Have a hot chocolate filled weekend! I sure hope you are feeling better very soon. Being sick with all you do is a bummer. The hot chocolate looks soooo good. I love Hot Chocolate, and this one sounds and looks super delicious! Have a wonderful weekend Tieghan! Thatnks Carlos! Hope you love it! Hope you have a great weekend to! Christmas in a mug, that sounds like my kind of drink! I might just have to sneak a travel mug of this into the ballet next weekend when we see The Nutcracker! This is PERFECT Tieghan! –> side note: I got the Bob’s Red Mill package the other day and I CANNOT wait to make those coconut macaroons!!! I’m saving them for when my mom comes for Christmas Eve to make them together. So thank you! Ah that would be perfect!! AH!! I hope you love the macaroons! Thanks so much Amanda!! You have pumpkin in the directions to make the hot cocoa- BUT it is NOT on the ingredient list???? I am wondering if it is a mistake? Hey Sherri, I am so sorry, that was a typo. All is fixed now! Let me know if you have other questions. Hope you love this. Thank you and have a great weekend! This recipe looks like a keeper, but was wondering about the pumpkin in the directions as well, thanks Tieghan! Hey Kathy! So sorry, that was just a typo. Let me know if you have other questions. Hope you love this. Thank you and have a great weekend! Love your photos and especially those mugs! Hi! So sorry, that was just a typo. Let me know if you have other questions. Hope you love this. Thank you and have a great weekend! Also wondering about the [pumpkin. Sounds delicious either way!!! Oh hot cocoa, glorious hot cocoa!!!! How could it get better that that mixed with sugar cookies? YUM! Thank you!! Yes they would!! My two favorite Christmas treats growing up! Hot chocolate a sugar cookies. YUM. Hope you feel better soon! This should definitely warm you up after being out in the cold Tieghan! It sounds just delicious and perfect for the holidays! 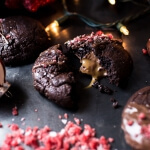 This sounds so creamy and decadent, I need a cup while we decorate our tree tomorrow! Christmas in a mug!! I love it! And speaking of mugs, where are these from?! so pretty! Your photos literally blow me away every day! Plus, this recipe = perfection! Ah your too nice!! Thank you so much! It’s 20 degrees here and that’s way below temperature for now. I will have to try that!! Haha!! Thanks so much!! Looks like a winter wonderland to me! 🙂 Hope you feel better fast – hot chocolate is the perfect cozy drink! Haha right!! Been drinking a ton!! Thanks so much Laura! time really flies..Christmas will be here before we know it. Way to fast!! Wish it could be christmas longer!! Looks delicious! I love coming here to visit, your recipes and photos are inspiring. Can I ask where you got the adorable mugs? Discovered your website a few days ago and I’m obsessed! LOVE your stuff, really love your Christmas spirit (I’m so into it, it’s hard to find people who love it as much), and your interesting creations. I especially love your styling–fabulous!!!! Been reading a ton of your posts. Merry Christmas and Cheers! Welcome!! So happy you found my blog!! Thank you so much Leah! Merry Christmas! ps–yikes! sorry for the duplicates, I hope you can delete them. I’m glitching out today! I really want to try this recipe! Are you using sweetened or unsweetened cocoa powder? I use unsweetened cocoa powder. Let me know if you have other questions. Hope you love this! Happy Holidays! ? LOVE the mugs that you used! 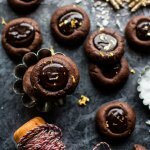 I totally need to try making this vegan friendly, because it looks to die for! So. GOOD!!! I’ve been planning to make this for my family for months, bought the almond extract and a can of organic condensed milk specially for this…somehow never got to it and forgot about it. Finally trying to pull together a brunch for supper meal (blueberry maple syrup topped dutch baby pancake, guys?) I remembered this recipe. Amazing!!! My guys loved it and I declare it to be the best homemade hot chocolate recipe I’ve ever made. This adds to my previous opinion that you are simply the most inspired young recipe-developer I’ve ever come accross in 40 years of reading and playing with recipes. 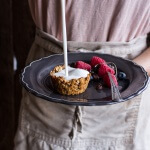 My tastes generally run more to that incredible detox salad you created some while back, the one with grapefruit, cabbage and avo with lemon tahini dressing…my go-to favorite solo supper last summer…but boy do you know what to do with sweets! Next baking episode will be those insane looking cookie dough stuffed pretzels. Ha! So excited about your cookbook. I can barely wait to buy and recommend it! I’ve already been scribbling down the name of your site to random friends and strangers for a good while now. I can never wait to see what your next creation will be! Thx for all you do. Thank you so so much. SO happy you got to make the hot chocolate and loved it!! Adorable! Like your Christmas in a mug. Cheers!! I am planning to serve this at a party and am wondering if you think it work to transfer it to a crockpot to keep it warm after making it in case i can’t serve it right away. Really Great, had for me & kids movie night watched Home Alone 2. & the character mentions hot chocolate, LOL! we had a movie dessert connection. Me & the kids loved, Thank you!!! Thank you so much Karen! I am so glad you enjoyed this hot chocolate! Also, such a great movie!